Because these types of items keep well, my pantry is always stocked. There are often coupons and competitive sale pricing from among the contending brands, and I can quite often find these items for free or near free. I’ve found generally, at least once a quarter, almost every item in the store will drop to a low price – there may be other sales on the item, but watch for the lowest lows. Snap them up then, using coupons wherever possible. Keep a price sheet so you’ll know what the best deals are. You’ll sometimes find that the lowest pricing will be on the smaller containers, and especially if you’re using coupons that will be the way to go (provided you have enough coupons to stock yourself up for a three month supply.) If not, go for the bigger container with the lowest per ounce pricing. I have an older kitchen, and cabinet space is at a premium. I keep my “lower” upper cupboards organized and stocked with the items I use all the time. Baking supplies are together, soups, tomatoes, vinegar, etc. Oddly shaped items like dried fruits are grouped together in containers. Dried beans are in jars. Everything is easy to reach in an instant and not overly crowded, with the things I use every day front and center. This saves me a ton of time and stress! My extras go in the high cupboards, roughly grouped together by type. That’s where I “shop” from – when my lower cupboard gets low on an item or two I take out the step stool and bring the item/items down. If you have a pantry, try organizing it in the same fashion. Put the items you always use front and center, and use the very top or very bottom for your “extra stock.” Shuffling around and looking for ingredients while your pots are on the stove, the kids are whining and everyone wants dinner is frustrating and time consuming. If it’s difficult to cook, the chances you are going to grab something, somewhere to go or rely on more expensive (and not as good for you) convenience items rises. When I start reducing my supply, I put the item on the white board under “Need Soon” and looking for sales and coupons for the next great price. I also have my weekly grocery list on my whiteboard, which is mostly fresh ingredients I’ll need that week, the best sales prices from the circular, and any items I’ve shuffled off the “Need Soon” list. When I store some items, like beans, cornmeal, graham cracker crumbs, bread crumbs, etc., I often store in other packages. I like to put some of these in glass containers like canning jars (plastic might work better with youngsters, although I’ve generally grouped a lot of these containers together, and there’s not much there the kids would bother.) I clip any instructions and drop them right in the jar with the contents. Canning jars are very inexpensive in late summer, especially with coupons. Sometimes I’ll find jars heavily discounted in the fall or early winter, especially in hardware stores. Check your craft, stores, too, like Michaels for larger jars – they’ll have coupons in their ads for 40 to 50 percent off items. Jars are very easy to keep clean, too – and they can be written on with a sharpie which will wash off. Asian Style Vegetables and Sauces: Look for these items at a very low price around Thanksgiving, before Christmas and during the Chinese or Vietnamese New Years, generally speaking the end of January or up to mid February depending on the nationality and culture. I often take a peek down the aisle because I’ll find unadvertised specials. Personally, I tend to buy a lot of the basic sauces like Soy, Hoisin, Fish, etc., but stay away from things that can be made simply and easily at home and tend to taste much better and cost less. Things like jarred sweet and sour or a lot of the canned or boxed mixes or dinners make me shudder! I do like to stock up on water chestnuts in particular when they’re on sale. Rinse them before using to get rid of some of the canned taste. Baking Goods: (flours, sugar, milks are below in their own categories.) I try to stock up on all baking products before the Christmas holiday, and I’ll watch, again, prior to Easter. There are always great sales and coupons. Baking Soda: Keeps indefinitely. America’s test kitchen recently did a testing on whether or not baking soda was of any use on eliminating or absorbing refrigerator odors. They gave it a big negative. Baking Powder: I’ve always heard to watch the dates carefully, and this is one product I’ll discard if not used. Corn Syrup: Keeps indefinitely. Carefully wipe off the cap and top before storing. Molasses: Keeps indefinitely. I’ve used the same bottle for years. Carefully wipe off the cap and top before closing. Yeast: I store in the fridge and test if questionable. Here’s a little tutorial on All Recipes about how to ‘proof’ your yeast. In December of 2011, I pulled yeast from my fridge (I hadn’t baked since March or so, and the jar had been opened for at least a year and a half) and checked the “best if used by date.” It was April 11, 2011. Notice the wording here: “best if used by” is NOT an expiration date. It’s cold and windy, and I didn’t want to go to the store. I followed my recipe, and proofed my yeast. Here’s “proof” that best if used by does NOT mean expired. Three minutes in to the 10 minute proofing process, my yeast was already growing and bubbly and smelling delicious…store your foods properly, and use good judgement in deciding whether or not to discard an item because the seller stamped a date on it. Last bought December 2011 – Red Star Quick Rise on sale for $4.29 with a coupon – jar states best if used by March of 2013, use within four months of opening. 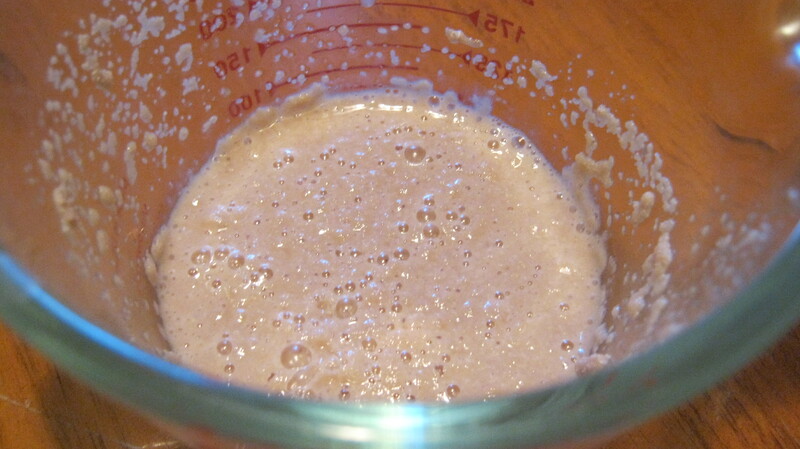 Of note: I didn’t quite need yeast at this time, but I knew there probably wouldn’t be a sale on yeast again until Easter, so I picked up while on sale with a coupon, knowing that it would be good for quite some time. 2 1/4 teaspoons is the equivalent of one packet. Rise temperature is 80 degrees. Alton Brown uses a heating pad set on low in a big bowl, then puts the bowl of dough on top and covers with plastic wrap. If your oven has a cool enough temperature you can use that to let your dough rise. Some people prop the door open. My mother placed pans of warm water in the oven. I often bake bread while I’m around the house making soup, so I set my dough on the back burner (not turned off) and the heat from the barely simmering soup keeps it warm enough. I rotate the bowl now and then. Yeast, 8 months past the “Best if Used by Date,” still perfectly good and bubbly. I always look for beans on sale (often unadvertised) around Holidays, especially before New Years and after Thanksgiving and Easter. Pintos and Black beans are often very inexpensive around Cinco de Mayo, and when they’re on sale, often the others are, too. I also check the ethnic section of my grocery store to see if beans or lentils are cheaper than the more “name brand” items in the bean/rice/pasta aisle. I look for a price of 89 to 99 cents per pound and stock up then. I have noticed in my area, the same grocery chains in the more affluent areas have higher prices than their counterparts in areas that are not as privileged. Soaking over night in water covering beans plus about 2 inches gives slightly better results than a quick soak, according to Chris Kimball of America’s Test Kitchen, but to do a quick soak, cover beans with water, bring to a boil, cover, turn off and leave for one hour. I’ll cook up batches of beans and put in Ziploc bags in 1 1/2 cup portions with a bit of the cooking liquid and freeze. You’ll get about three of these bags, roughly, to a pound of dried beans. Each is about the equivalent of a 15 ounce can. Often, I’ll do this on an afternoon I’m piddling about the house or during an evening watching movies or on the computer. Sometimes I use my pressure cooker (For me, a pressure cooker was a must as a busy, working Mom) and cook up my beans in minutes. I do like to store beans in glass canning jars – they look pretty, stay fresh, and it’s easy to see the contents. This way, I don’t have bags sliding and breaking open in the cupboard, and I can see at a glance what I have. At the very least, group them in another container. I try to use within a year or two – very old beans can take a LOT of cooking time. I also freeze beans, peas and legumes for four days when I bring them home. I also keep a small tin canister of beans on hand that I use as pie weights for blind baking shells. I’ve used the same beans now for about 10 years or so – so that was a cheap investment. Watch for big sales on chocolate and chocolate chips starting a bit before Thanksgiving and continuing through Christmas, and again right before Easter. You can generally count on a 12 to 18 month shelf life on supermarket chocolate, perhaps even longer if stored properly. Now and then you’ll see a “bloom” on chocolate. This affects the texture and mouthfeel of the chocolate – it’s still safe to use, but not at its premium. I have to limit how much chocolate is in my house – my kids will ALWAYS find it and eat it – even when I hide it. If I could train them to do the same with drugs, I swear I could rent them out to various law enforcement agencies. Toffee Chips or bits: These will definitely develop an off flavor if stored too long. Watch the dates carefully on these. Condiments: I always watch for these to go on sale with a coupon and stock up when that happens, generally once a quarter. I also look for deals on these, often on the packages, that include other items: Buy 3 salad dressings, get salad free. Buy 2 pickles, get a pound of meat at no cost. This is one category where you will often see the smaller or newer brands carrying coupons more often than the big manufacturers – but sometimes you’ll find the larger producers giving specials like: “Buy any five items, get $5.00 off your next shopping order.” Carefully consider these and buy if they are to your advantage – can you stock up for the year by just buying, say, five of the ketchups and leaving the hamburger helpers and canned pasta on the shelf? Certain items are often cheapest during the summer: They include things like ketchup and mustard (although the better mustards are often on sale in the fall.) Barbecue sauce is generally at it’s lowest in the summer, as are mayos and bottled salad dressing. I’ll try to stock up for the year on these types of items. Many condiments are free with the right sales and the right coupons. I didn’t do as well as I would have liked to this summer on my shopping, and some of my pricing reflects that. Barbeque Sauce: I generally look for a price between free and about 88 cents. Chili Sauce: Heinz, 12 oz bottles, regularly $2.19, last bought 10/11 for $.89. Hot Sauce: I’m not very brand loyal; I’ll try to pick this up whenever on sale with a coupon, and find it ofen free or just a few pennies. If I have to pick up without a coupon, I’ll get the largest bottle with the lowest per ounce price because we use it so often in recipes or as a condiment. I have several free bottles in my pantry. Ketchup: Heinz, 40 oz bottle, regularly $3.38, last bought 10/11 for $2.00. (See, I didn’t follow my own advice and buy enough to last until the best sales next summer, and had to pay a higher price than usual on this!) Now in November, against all odds, I bought 2 36 ounce bottles of Heinz for free. Mayonnaise: I bought 8/11 at $2.99 for 32 ounce jar, which was not a great price, and again in April 2012 for $1.99 for 32 ounces with a sale and coupon. I always buy the jars, not the squeeze bottles because they are generally the same price, but you get a larger jar, and there is less waste. If I’m making a recipe that calls for a lot of Mayo (potato salad, cole slaw) I’ll whip up some home-made for dirt cheap. Gulden’s: 12 oz bottle, Regularly $1.77, last bought 10/11 for $1.57. Koop’s Yellow: 24 oz bottle, regularly $1/42, paid 10/11 $1.35. I’ve seen couponers say they never pay for mustard: in my area I rarely get it for free, and have difficulty getting coupons for it. Worcestershire Sauce: Lea & Perrins, 10 oz bottles, regularly $3.19, last bought 10/11 for $.79. If you live in an environment with lots of heat and humidity, you may be prone to getting “flour bugs.” (A person at Pillsbury’s quality control told me that this is a normal thing and mumbled something about so many bug parts per million being acceptable! I hadn’t known until then that this included live critters!) Keep this in mind when you consider how long to store flour. The Pillsbury lady told me to freeze for four days or refrigerate for 30 days when you bring your flour home – I’ve done this ever since and have never had another problem. If you live in the south, particularly be careful. Fruits, canned: We’re big on fresh fruit, so I don’t often buy canned unless I can get it really cheap or free with a coupon. It is nice to have some in the cupboard to pull out when nothing else looks good or you don’t have much else in the house and can’t go to the store – there are certainly worse snacks. Applesauce: I don’t generally buy the small snack packages – when the kids were young and needed something for their lunch, I’d just divide the big, cheaper jars up into little containers. I do like making applesauce in the fall and filling the house with the aroma. Mandarin Oranges – I love using these in salads and always have them on hand. I watch for sales and coupons before Thanksgiving and Christmas. Pumpkin: I’m not much for most canned fillings, but pureed pumpkin is a huge exception. I stock up during the winter holidays when they reach their lowest prices. If the large cans are cheaper, I’ll divide them for a recipe and freeze the other half in a Ziploc bag. I’ve had people tell me that they actually buy canned pumpkin a year ahead for their Thanksgiving pies…the long storage time mellows and improves the taste. I’ve generally found that unless you’re growing your pumpkins and canning, or have a great source for a good price, it’s more expensive to make homemade puree, and the recipes I use are generally so heavily spiced with cinnamon, clove, ginger and/or allspice that I’ve not noticed a difference in taste. Others swear by homemade, so here’s a link for making your own, from the Pioneer Woman. American Test Kitchen noted that Libby’s has the best rating. Last bought October 2011, 29 ounce store brand for $1.79. Libby’s 29 oz was $2.79. Fruit Juice: I look for a price from free to 79 cents a bottle. We use very sparingly at our house. I will watch for new brands or varieties – when that happens, there are often great sale prices at the stores and a lot of coupons from the manufacturers. They really want you to try the new products. Stock up then. Fruits, dried: Seal well, and if buying in bulk, put into heavier plastic, or in jars in plastic. Most types keep almost indefinitely. Buy these during the Christmas and Thanksgiving holidays – you’ll find the best pricing and coupons. Honey: I generally buy at Walgreens, yep, Walgreens! Honey goes on sale every there every so often for a very low price. Now and then, on a splurge, I’ll buy from a farm stand or the farmer’s market, or I’ll buy if I’m traveling and find a special variety. That special honey I’ll use where it matters most in recipes where the flavor really shines through. If your honey becomes crystallized, put in a pot of water on the stove top and gently heat, or put in a container of water and heat on low in the microwave. Condensed and evaporated I always pick up before Thanksgiving, Christmas and before Easter when the best sales are on and there are coupons available. I’ve used both these products for years past the “best by” date. For 70 years or so, there were never any dates on them at all. The “Best By” dates on the can are a very conservative date. Condensed milk, when stored long periods of time may turn a bit caramel in color. Coconut milk – When stored for long periods, this product will separate, but stir it back together and use. Nuts: For me, these are really a freezer item – I bag them in a Ziploc to keep them as fresh as possible. The big brands have coupons, especially around Thanksgiving and Christmas, and the best sales seem to coincide with these times. I have a freezer, so I try to buy enough to last for the year during the winter Holidays. Watch your prices here carefully when shopping for nuts, it really can be worthwhile to bring along your calculator. They’ll likely be nuts in three different places in your store, perhaps four: The health aisle, the bulk bins/produce aisle, the baking aisle and the snack aisle. You’ll find them priced by pounds and ounces and in different package sizes, so in order to find the best deal, you’ll have to be great at figuring in your head if you don’t have the calculator on hand. There price alone may seem like a bit of a splurge, but I’m making a real effort to include more nuts in my diet – they are highly recommended for a healthy diet. If you have a source for really good nuts in the shell and the patience to crack them yourself, you can get really great deals…for me that’s generally a Christmas thing; put out the nuts and the nutcracker for guests and family. Pasta: I find pasta on sale all the time at my grocery store for $.99 lb. I, personally, have not paid for any of my pasta except for lasagna noodles for several years. I’ve found by buying the higher quality high protein/low carb or whole wheat varieties I can usually use a coupon, probably because there is such stiff competition between the different brands. My store doubles these coupons on Wednesdays, making pasta, for me, either free or a “money maker.” Lasagna noodles are not usually in these sales, so I expect to pay a little extra for them. I literally have not paid for pasta in several years, and have donated quite a bit to other families by watching for sales combined with coupons. When I store my dried pasta, I place it in the freezer as soon as I bring it into the house and leave for 4 days. If there is no room in the freezer, put it in the fridge for 30. This will destroy any “flour” bugs that may be lurking in the pasta. Soups: Buy in the fall or before Holidays. Use coupons and sale prices to vastly lower the cost. I use cream of soups as a convenience item – sometimes I just can’t take the extra step to make my own so I’ll always keep them on hand. Every year in the fall, I’ve found I can get cream soups, tomato and chicken noodle for free or under 10 cents a can with coupons and sales, so I stock up then. I usually have a few cans of soup on hand for emergency meals. It’s really hard to pay anything more than a few cents for a can when I can often make a homemade soup that’s hearty, delicious and healthy with no added ingredients for so much less. I will break down pots of soup into individual or family sized servings and freeze, so it’s nearly as convenient as canned. I make my own broth regularly from chicken bones and vegetable scraps, and about the only time I’ll pick some up is to have on hand for the holidays, when I often go through a large quantity. I usually have some type of jarred chicken base on hand and will use that if I don’t have my own broth or if I need some fortification. I prefer the ones that are wet as opposed to the powders. They go on sale, but I’ve rarely seen coupons for them. When I need beef stock, I’ll often cut it with chicken broth in the recipe, a hint I learned from America’s test kitchen. Beef stock can be very expensive to make, and the canned ones seem to always have an ‘off’ flavor. The chicken broth helps to mellow the taste a bit, but still lets some of the beefy flavor come through. Sugars: Often on sale before any Holiday, especially at Thanksgiving, Christmas and Easter. I’m not a heavy year round baker, so I try to stock up at these times. You’ll especially see the smaller bags on sale. Brown Sugar: C&H, 2 lb bags, regularly $2.39, paid in 10/11 99 cents, November 11 I paid 60 cents a bag and stocked up. I keep brown sugar in the bag, but put the bag into Ziploc. If it get’s lumpy, I add a heel of bread into the bag and it will soften up again in a few hours. Powdered Sugar: C&H, 2 lb bags, paid in October ’11 99 cents, and in December for 60 cents. White Sugar: Last bought 10/11, 4 lb for $1.69, 42 cents a pound. I look for prices of $1.49 to $1.69 per five pound bag, on sale, and often with a manufacturer’s coupon or a store coupon. White and Brown: I almost always use regular rice, never instant or minute, and generally not the flavored packets – probably the one exception is “Uncle Ben’s Wild Rice & Turkey Casserole.” I make it after Thanksgiving, almost every year, and it’s always on sale then. If you have ingredients on hand in your pantry and fridge, it’s so simple and so cheap to jazz up your rice, and there are no offensive or strange tasting ingredients. Life is too short to eat bad rice! White Rices: I really do use plain old rice for a lot of recipes just because of availability and price. I was a little shocked once at how reasonable some of the fancier rices are in the south compared to my northern clime! I do buy specialty rice for some dishes, but they’re not always a staple in my pantry. A note on cooking white rice: I generally use a 2 to 1 ratio of water to rice. Put the rice in the pan, cover with water, bring to a boil, lid and reduce to a low simmer. Ready in 20 minutes. I was told once by elderly Asian woman that she measured by putting in enough rice to come to the top of her fingernail, and then added water to her first knuckle. She said it works for everyone, and it worked for me, several times when I’ve been places with no utensils, camping and such. I’ve always remembered that because I found her so absolutely charming. There’s nothing like taking to someone who’s been cooking 70 years or so and hearing their stories and tips. I’d imagine you’d need to make an adjustment if you have very long nails! Brown Rice: If you are wanting the healthiest rices, look to brown – it takes nearly twice the cooking time – about 40 minutes instead of 20, but you can make rice while you’re making your dinner, or even make it the evening before and reheat at the dinner. I’ll even make extra and freeze for very short periods of time, only a week or two. That can shave off a bit of time in getting dinner on the table. Rice is becoming more like bread, with a lot going on to try to make it look more healthy – read your labels, carefully. When buying brown rice, for the best benefit, look for grains that are as whole as possible. Sometimes these are labelled “natural,” but if the grains are dull in appearance rather than shiny that’s what you’ll want. I do look for sales and match with coupons, and if I have enough coupons I’ll buy several bags or boxes. We’ve been lucky here with the Riceland Rice – the coupons out there have made their smaller boxes and bags cost pennies for most of the fall. If I have no coupon or limited coupons, I’ll buy the largest bag available (within reason, of course.) It pays when shopping for rice to check the rice/bean aisle, but also check in the ethnic or global aisles of the store: Mexican, Asian, and Indian in particular and compare prices. Rice is another product I’ll bring home and freeze for four days just to eliminate the possibility of any infestation. Wild Rice: A grain, but most people treat it as a rice. Usually on sale around Thanksgiving and Christmas, it’s worthwhile to stock up then. Expensive, but a little bit goes far, especially when mixed with other rices or grains. If so, the cooking times will vary. There are different grades, depending on whether you are buying perfect whole grains or ones that have been broken. I often buy the lesser grade – the flavor is the same, but the cost is so much less. If you visit someone “up north” by all means, pick up a package or two to take home with you – there are huge regional differences in price. Wild rice is a great way to add flavor and texture to a meal with a vegetable medley or combination of rices, and always handy for soups. Every meal feels more special with wild rice on the plate. Cook up extra when you make it, seal it tightly and freeze. Vegetables, Canned: I’m a little picky about my vegetables, but there are several things I’ll buy canned: Artichoke Hearts, Corn, Sauerkraut (if I can’t find the refrigerated kind), tomato products, water chestnuts. Since cans keep so long, I stock up at the best prices I can find and always buy on sale with a coupon if I can. Tomato Products: I’ll stock up on canned tomatoes whenever they are on sale, and especially if there are coupons available during the sale period. I often get canned tomatoes products free or at a greatly reduced price. Whole Tomatoes: For the greatest versatility, I’ll generally buy plain whole tomatoes, but I don’t really mind if I can get the other varieties cheaper. I’ll crush them myself, by hand, removing any hard bits around the stem. (Watch for squirters, and don’t do this while wearing a white blouse!) I like to buy the larger cans as they are generally inexpensive – I’ll put what I don’t use in a Ziploc bag in the freezer, labelled. If I’m not using the juice, I always measure and put in a Ziploc bag and use it instead of tomato juice in the occasional casserole or when making meatloaf, stew or soup. Bought October 2011, 8 cans of 15 ounce Red Gold tomatoes for free, 6 29 oz cans of Red Gold Tomatoes for 59 cents each. Prediced Tomatoes: I have found that generally the prediced tomatoes seem a bit harder and often don’t “melt” into a lot of recipes the way I like, but this is a bit of a bonus if I’m substituting for fresh tomatoes. Last bought October ’11 for 99 cents for a 29 ounce can. Tomato Sauce: I’ll buy canned sauce for things like sloppy joes or some Mexican and Italian recipes, and again, I treat it pretty much the same way as canned tomatoes. Divide the larger cans and freeze. In a pinch, I’ll just whir up the whole canned tomatoes with the juice in the blender. Tomato Paste: I often find this free with a coupon and stock up then. Since many recipes call for a tablespoon or so, I store this in the freezer in snack sized Ziploc bags. Vinegar: Every so often they’ll have coupons for vinegar, making name brand lower than store price. Best time to buy is generally around Easter for the basic White or Apple Cider. Summer is usually when you’ll find the good cooking vinegar on sale. I’ll find sale prices, too, around Thanksgiving and Christmas. Stock up on the best prices because they keep forever. Often sales are not advertised, and you can find coupons, now and then, for both the basic and the fancier vinegars. Now and then you may see vinegar bloom – this is what they call “the Mother.” Not very attractive, and sometimes downright horrendous looking, but it does not affect the quality of the vinegar.